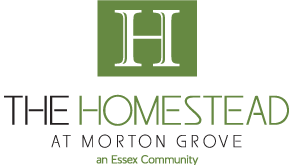 The Homestead at Morton Grove is a rental retirement community for people 55 years of age and older. Our community is designed around the needs of active people who want to simplify life, enjoy retirement without financial worries, and look forward to a maintenance-free lifestyle. You will enjoy expanding your horizons, making new friends or entertaining your guests in our spacious community rooms at The Homestead, including our atrium entry, great room/party room, sun room, wellness center/exercise room, private dining room, library, business center, optional hotel guest room, and scheduled transportation. Our new four-story community features 82 apartment homes ranging in size from 781 square feet to 1,257 square feet. Every apartment home features a fully applianced kitchen, oversized windows, window treatments, large closets, large capacity washer/dryer, individually controlled heat and air conditioning … and nearly every apartment home features a private panoramic balcony/terrace. The Homestead offers two series of apartment homes – The Avenues and the Affordable Series. The Avenues offers several different floor plans ranging in size from 781 square feet to 1,257 square feet. Our Affordable Series offers five different apartment home floor plans ranging in size from 781 square feet to 1,172 square feet and will be priced at affordable rates based on meeting resident income criteria. The Homestead at Morton Grove is located at 6400 Lincoln Avenue in Morton Grove. Call our Executive Director today to schedule an appointment to learn more about our new rental retirement community located in the heart of Morton Grove. Call today to schedule a tour of our beautiful community…. (847) 581-1800, You are sure to appreciate our graciously appointed community rooms, spacious floor plans, energetic staff and warm and welcoming residents!